You are here: Home / Ethnic Groups / The People of Sulawesi / Who are the Cia-Cia? 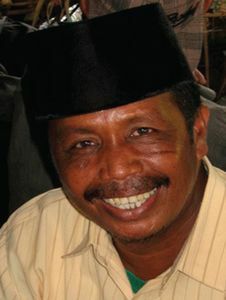 The Cia-Cia people are found throughout the southern part of Buton island, generally in the more rural areas. These people also inhabit the remote island of Batu Atas (south of Buton) as well as the eastern half of the island of Binongko in the Wakatobi island chain. The traditional laws and customs of the Cia-Cia are very strong. The Cia-Cia can be found inland and in coastal communities. Back in the 1970’s, the government forced most of the villages to move to the coast so they could provide for themselves, but a few remained inland. The remaining mountain communities have stronger traditional laws and beliefs. There are several communities on the east side of central Buton whose language is similar to the southern Muna dialect, but they have a closer cultural connection to the Cia-Cia. The land they live in is still undeveloped. A large portion of it has been set aside as a national forest because of the large number of rare animal species that live there. The Cia-Cia language is part of a larger language group under the Buton subfamily. The Cia-Cia earn their living as farmers or fishermen, depending on where their village is located. Those close to the sea are seaweed farmers as well as fishermen. Those living inland grow cashews, corn, cassava, cacao, and coffee. Their land is currently being explored by foreign companies looking for oil and other minerals. Buton Island has the largest deposit of natural asphalt in Southeast Asia. There are currently a few asphalt mines operating that provide some jobs. In general the Cia-Cia are very wary of people coming and taking their land without providing benefits or obtaining their approval first. The Cia-Cia have always had a close relationship with the Wolio and these two groups often live close to one another. Almost all Cia-Cia people have identified with Sufi Islam, but the Hindu and animistic traditions of their past are very active. According to their teachings, they practice meditation in order to receive visions from God, or to find hidden truths far beyond their own reasoning. Dreams are seen as solid evidence from God about how they should conduct themselves in life. Food and flowers are still offered at graves to obtain blessings for the coming harvest. The Cia-Cia also believe that evil spirits cause illness, while helpful spirits give guidance. A few villages send their inhabitants to the top of a mountain for a week every year conduct rituals for the year to come. Cia-Cia people are very mobile. They have spread into other areas. However, they need training and assistance to better manage their natural resources. They need formal education as well as practical training in order to take advantage of employment opportunities. They also need more medical attention, clinics and medical personnel.